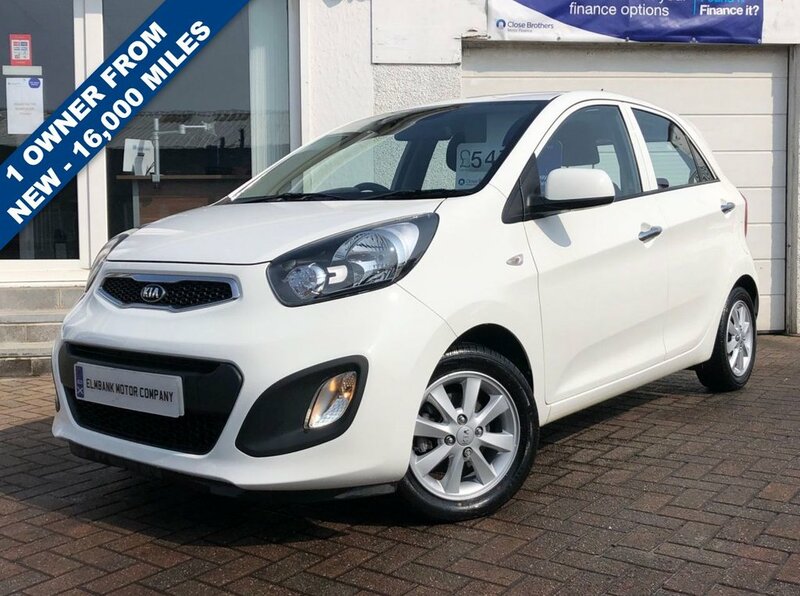 2014 14 KIA PICANTO 1.0 VR7. A STUNNING LITTLE CAR ON OFFER, ONLY 1 OWNER FROM NEW AND TRAVELLED JUST 16,000 MILES. EXCELLENT TO DRIVE, LOW INSURANCE, EXCELLENT MPG AND £0 ROAD TAX PER ANNUM. ON BOARD SPECIFICATION INCLUDES ALLOY WHEELS, CD-RADIO, AIR CONDITIONING, REAR PARK ASSIST, BLUETOOTH AND ELECTRIC PACK. SUPPLIED WITH 12 MONTHS MOT AT POINT OF SALE. WE WELCOME ANY AA OR RAC INSPECTION AND CAN OFFER BESPOKE FINANCE PACKAGES. TO ARRANGE A VIEWING OR TEST DRIVE PLEASE CALL ELMBANK MOTOR COMPANY AYR ON 01292 292991.